C. Tenant leases 1225 Main Street Premises from Landlord pursuant to a Build-to-Suit Lease dated as of _________, 200_ (the "1225 Main Street Premises Lease"), and leases Adjacent Premises from THIRD PARTY pursuant to a lease dated _______ (the "Adjacent Premises Lease"). (A) PREMISES. Landlord hereby leases to Tenant __________________ parking spaces located in the area described in Exhibit C attached hereto and made a part hereof (the "Tenant’s Parking Area"), for the sole purpose of parking vehicles by employees and invitees of Tenant. (B) TERM. The term of this Lease shall commence on the date hereof and shall terminate on the date Tenant, or its permitted successor or assignee, ceases to operate its business at Adjacent Premises, ___________________, ___________________. (C) RENT. 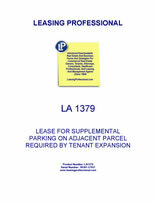 Beginning on the date of this Lease, Tenant shall pay to Landlord as rent the amount of $________ per year, payable on the second day of each calendar year; provided, however, that in the event that the 1225 Main Street Premises Lease is terminated for any reason, commencing upon the first day of the first full calendar month following the month in which such termination takes place, and on the anniversary of such date each year during the remainder of the term of this Lease, Tenant shall pay to Landlord an amount equal to $________ (subject to an annual increase of two percent (2%), commencing on the first anniversary date of this Lease and on each such anniversary during the term hereof) multiplied by ____. Additionally, in the event that the 1225 Main Street Premises Lease is terminated, Tenant shall pay, in addition to such rent, its pro rata share of surface parking maintenance costs at 1225 Main Street Premises. For purposes of this section, "pro rata share" shall equal __________%, and "surface parking maintenance costs" shall consist of the recurring expenses of maintaining surface parking at 1225 Main Street Premises, including costs of sweeping, patching, resealing, restriping, lighting, landscaping and insuring the surface parking areas.